Ludhiana, October 03, 2018: Mirza Ghalib would have approved of it. Shah Jahan would have been one of our frequent customers. 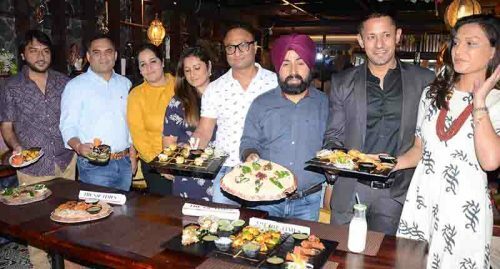 After creating sensations in Delhi and Gurgaon in last 15 years, Not Just Paranthas (NJP) forays into Punjab with opening of their outlet at Pavilion Mall in Ludhiana where people of city will now get the best taste of its history. Inspired by the famed Paranthewali Gali in Delhi, NJP has created a unique cuisine in itself, exhibiting mouth-watering collections of the finest traditions of Indian cuisine which of course includes paranthas and the kebabs. NJP is a kitchen full of inventors. With Never heard of products and fascinating gourmet fusion food, not Just paranthas has redefined the art of Parantha makings. From Mirch Lehsuni Paranthas to Prawn Paranthas and exotic paranthas such as Sharabi Paranthas (served flambéd – one and only of its kind), and Kebabs in a Pocket Paranthas, NJP has it all, besides the ubiquitous Aloo Parantha. For the palates who are inclined towards the Western taste, not Just paranthas has included Pan Parantha Pizzas, Italian Calzone pizza paranthas, Mexican quessidilla parantha and continental sandwich paranthas to name few, in its big booty. NJP has also introduced melt in mouth Rabri parantha and Paan parantha to finish your meal.